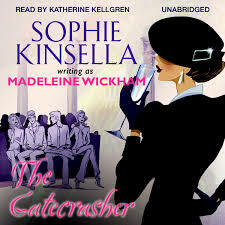 This one is easy I thought I last I read was “The Gatecrasher” by Sophie Kinsella,Madeleine Wickham. It was okay. Sophie Kinsella is the author of “Shopaholic” chick lit series from the “Confessions of a shopaholic” fame. I simply love her writing style. And all the books from the shopaholic series. But somehow I didn’t find her other books quite upto the mark. I have read The Gatecrasher & The Tennis Party are bad. The Undomestic Goddess, Can you keep a secret? are better. Sophie is her pen-name and Madeleine is the real name. I guess she fares better when she writes as Sophie instead of Madeleine. Has anybody read her books? What do you think? I read a book in the shopaholic series and it was total fun. Light hearted, easy read. I read the Undonestic Goddess and liked it too. I brought Twenties Girl from the library but am yet to start reading it.